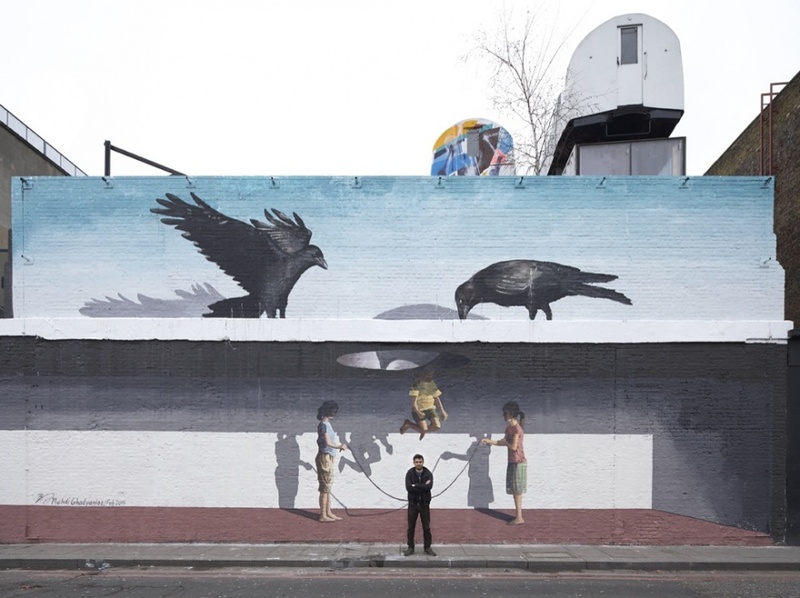 On a wall in east London, two giant crows loom over two young women who are swinging a rope. As a child jumps over the skipping rope, he approaches a hole in the ceiling above him. But if he finally jumps high enough to rise above the confines of the concrete ceiling, he will become prey for the waiting birds. 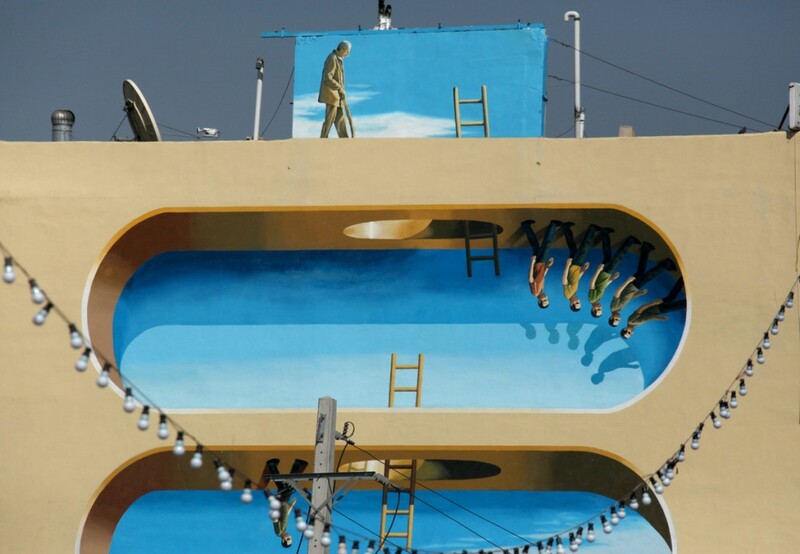 This is a mural by Mehdi Ghadyanloo, an Iranian artist who is about to have his first exhibition in Britain. It is an unexpected addition to the walls of Shoreditch; the neighbourhood famous for its street art rarely sees anything as subtle as this. As if to make the point, a car park nearby is plastered with ugly, third-rate graffiti. 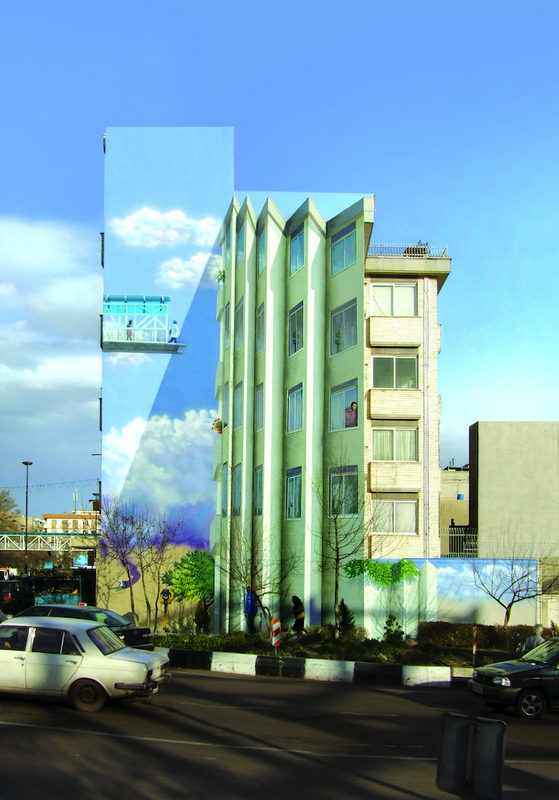 Ghadyanloo, by contrast, makes use of trompe l’oeil, the technique invented in the Renaissance of using perspective to create eye-fooling illusions. It is eerily arresting and poetic. His paintings are not illegal. 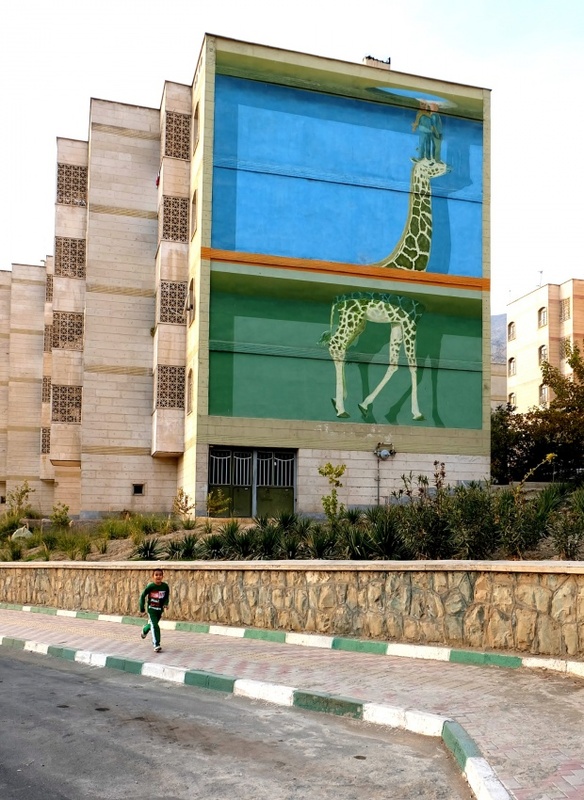 On the contrary, he was commissioned by the city government to paint them. 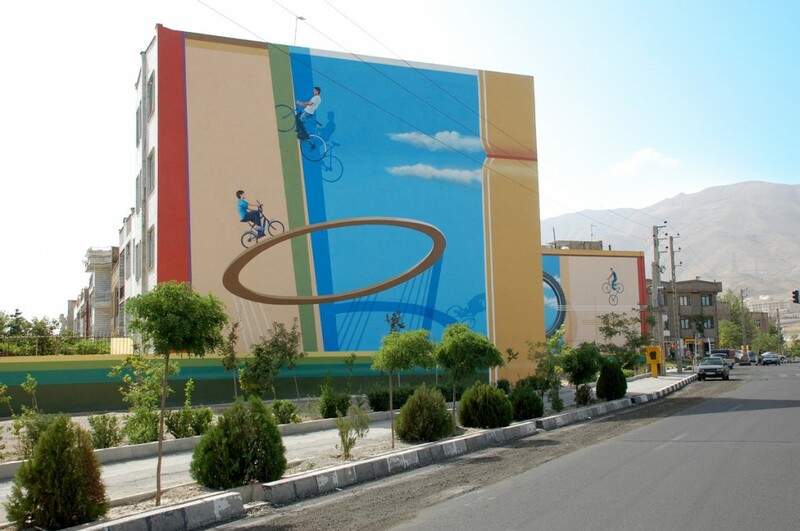 Nine years ago – in 2006, or by the Iranian calendar, 1384 – “the municipality published a call for artists”. Fresh out of an art course at Tehran University, he applied. 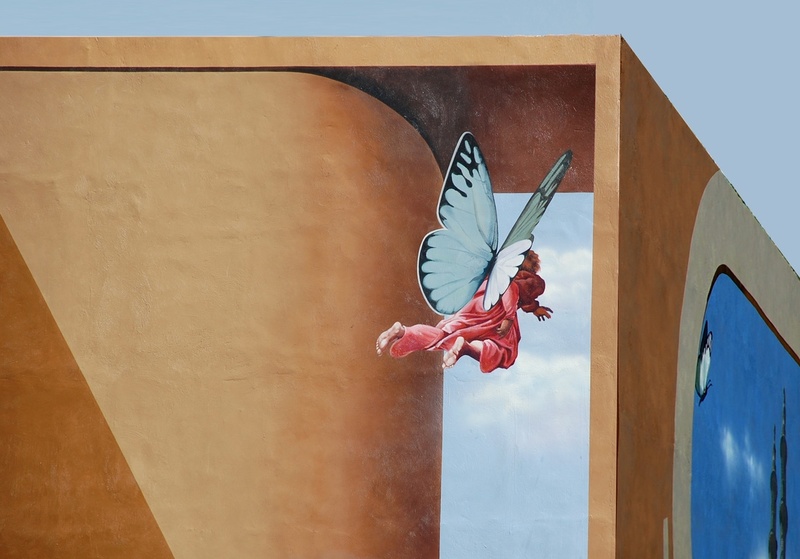 Using his mastery of trompe l’oeil, he paints huge walls with what he calls suggestive moments from unwritten short stories. His scenes are dream-like, ambiguous. Cars fly in space in a science-fiction city. Holes open to reveal blue skies. Fairies peep through the portals. People walk on roofs. “I want to give a smiling moment,” he says. Freed from social responsibility, his canvases on show at the Howard Griffin Gallery take his surreal style into more troubled corners of the psyche. A crowd of people stand beneath an immense stone cube that may fall and crush them any minute. Why don’t they run? In other paintings, people gaze into voids, or are crammed into boxes. 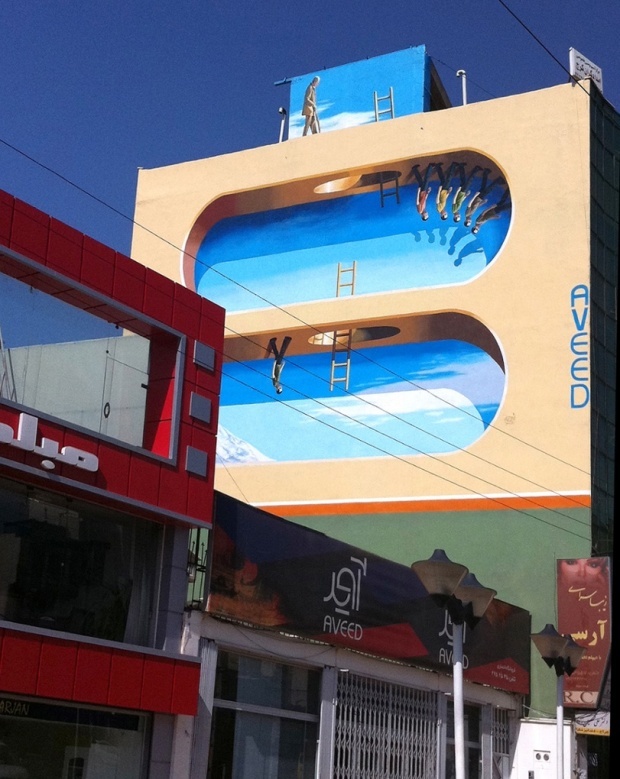 Ghadyanloo is clearly influenced by surrealist art. 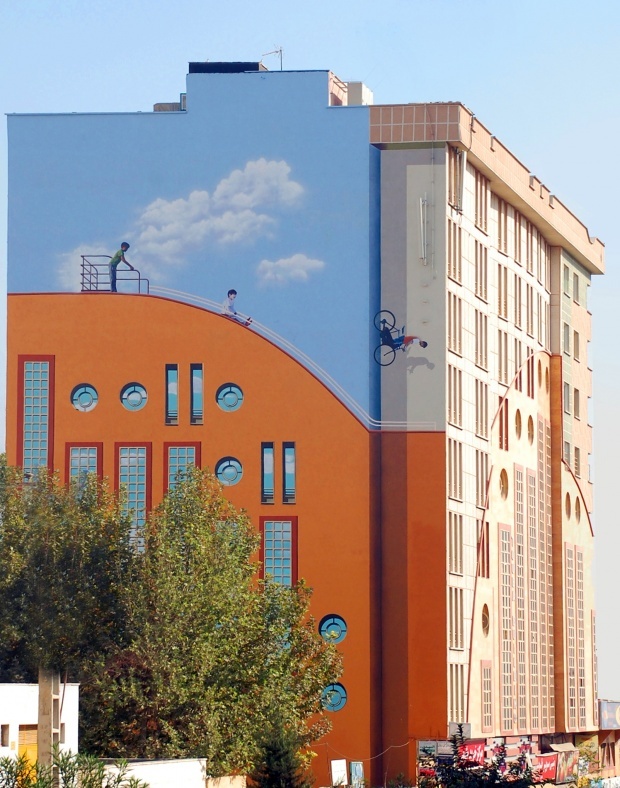 Echoes of Magritte and Max Ernst hover in his paintings. Not only does he like surrealism but in conversation, he quotes their hero Freud, and attributes his images to the “subconscious”. He’s a surrealist through and through. 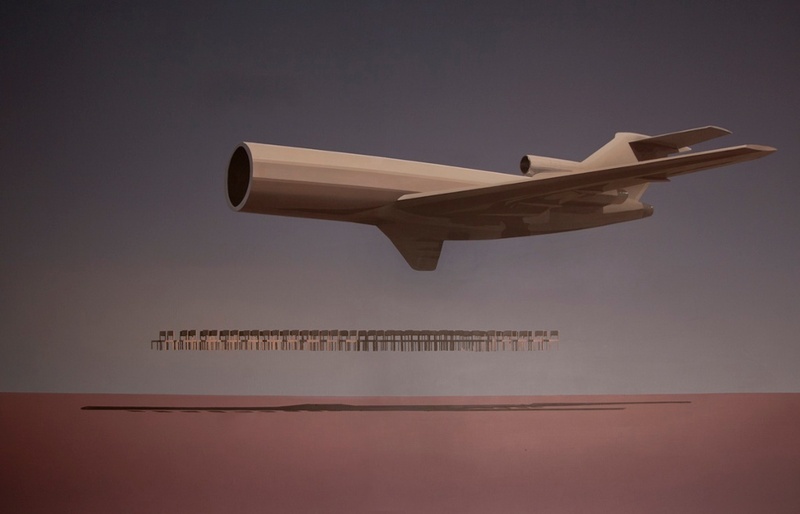 In one of his paintings, an impossible, hollowed-out jet plane hangs over another of his helpless crowds. It has something in common with Max Ernst’s collage Murdering Aeroplane. But Ghadyanloo explains that its origins are very personal. 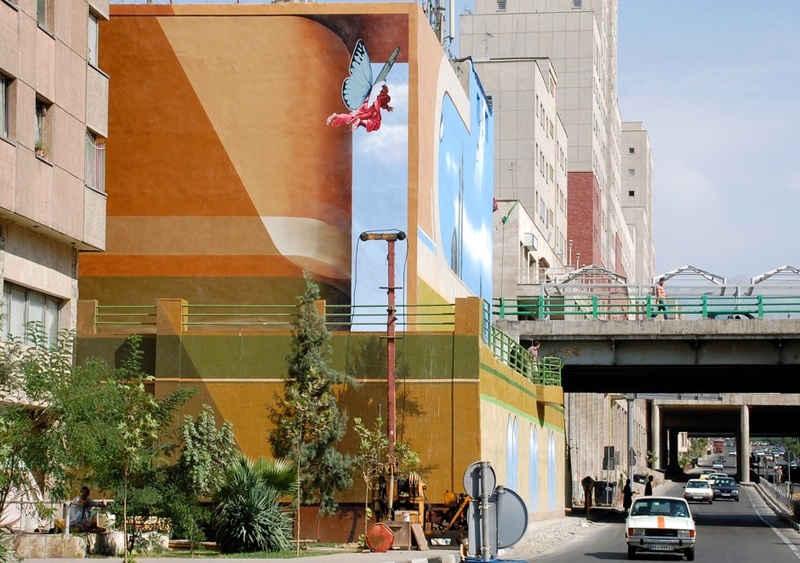 Out on the street, he explains that his new murals in London are different from the dozens he has done in Tehran. His London street art is personal and haunted, more like his canvases. Little people float lost on the wall of an Asian streetfood restaurant. Then we come to the powerful scene of the boy skipping upwards, towards freedom, towards death. Living in the Middle East, he says, the news brings fresh anxiety every day. “It affects your subconscious – and you have always this subconscious fear.” The birds are waiting for the boy to leap on to their beaks. 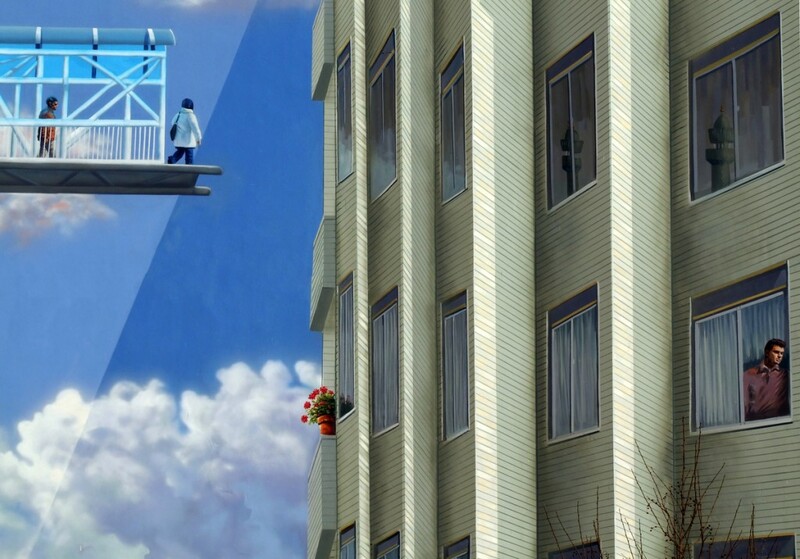 • Mehdi Ghadyanloo’s Perception is at Howard Griffin Gallery, London E1, until 2 April.